A person faced so many problems in life, their can be a specific reason behind this Kaal Sarp Dosh. Are you suffering from lots of negativity, ill health, fears, lot of insecurity and failures in every step of life? You cannot find a reason for such obstacles and lack of mental peace in your life? It might be due to the very serious and destructive ‘kaal sarp dosh’ affecting your life. Recently, this kaal Sarp dosh has become a very common issue, a very usual thing of discussion. It is considered that an individual affected by this is a total sufferer and has nothing good in life. There are so many astrologers and so many offering remedies. It’s a tough task to find out the best one when you are in turmoil. We are here for you, come talk to us. Before delving into this dosh in details, you should be rest assured that we do not take any hefty charges from the customers for lots of pujas and yagnas. No, we are not here to take away money from your pocket when time is not right. We are a reputed astro consultant and we do not believe in the ‘same concept fits all’ program. Every individual is different and this is more evident when it comes to kundalis (birth chart). So, first we take a look at your birth chart and suggest a very easy and affordable solution to get rid of this dosh. Any dark unseen element that is bothering your life is a villain, so is this dosh. 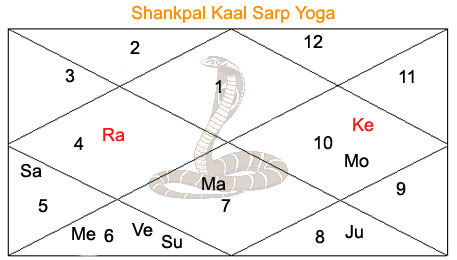 Kaal Sarp Dosh is a Sanskrit term where Kaal stands for time, Sarp stands for snake and Dosh stands for ill-effects. It’s a very unholy phase and extremely dangerous as well. It shadows bad effects on all walks of life, makes easy tasks difficult and brings down your confidence. This dosh happens when all of the seven planets Sun, Moon, Mercury, Venus, Jupiter, Saturn and Mars are confined between rahu and ketu. 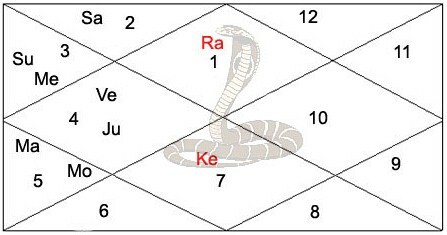 Both rahu and ketu in the chart are placed infront of each other. 47 years is basically the huge time period of this dosh but again it varies from one individual to another. Astrologers fear the malefic effects of this and here we try to mend it really fast. To be precise, in this dosh The Rahu acts as the serpent’s head and Ketu as the serpent’s tail. It sounds so terrific and it is actually. The presence of this malefic aspect in one’s Kundli can prove to be extremely harmful. It can have some really devastating effects on any domain of one’s life such as love, money, career, family, marriage and profession depending upon the position of Rahu and Ketu in the natal chart. More or less, every aspect of an individual having this dosha in their horoscope is adversely affected. 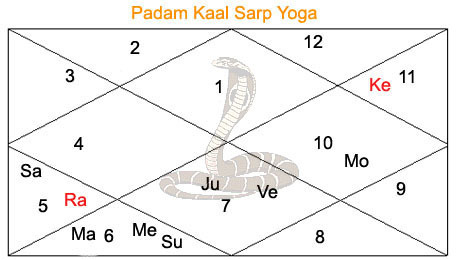 Even if a person has good and favorable planetary positions in their horoscope, Kaal Sarp Yog nullifies their positive effect. This dosh also has partial effect on individuals and this happens when one or more than one planet is on the other side, then the effects are not intense. One thing must be noted that not every person possessing this kaal sarp dosh is unlucky. The side effects vary a lot from one person to another because as I mentioned before every individual’s horoscope is different. For instance, if an individual has a Raj Yog along with the kaal sarp then the ill effects are minimized. So, it’s very important to visit our chamber for a consultation. We claim to be one of the best astrologer in Delhi . If one is affected by Kaal Sarp Dosh in their birth chart, they mostly dream of dead people, mainly their ancestors and family members who have departed recently. They might also be affected by dreams related to their own property and water bodies and sometimes they might feel as if someone is trying to strangulate them. According to Vedic Astrology, it’s been said that the victims need to go through lot of hurdles and bad times if not taken care properly. They are captured by loneliness and the feeling of being separated from all others and they do not have a voice to speak up for themselves. Individuals having this Yog or Dosh in their Kundaali, might be bitten by snakes, they fear snakes and can also dream of snakes. They mainly dream of being surrounded by snakes and this reptile coiling them. You should also know they affected natives also have the fear of height and loneliness. In all life is not good living with this yog, you need to sort out and get rid as soon as possible. Anant Kaal Sarp Dosh – Anant Kaal Sarp Dosh affects when Rahu is positioned in the first house and Ketu is placed in the seventh house. This time the remaining planets are all present in the left side of the axis. This phenomenon is also called the Vipareeta Kaal Sarp Yog. This phase is very bad for marital life. So, individuals who are affected by this dosh would suffer from stress, anxiety and inferiority complex. The truth is that people affected by this tend to get married late. These natives have to work excessively hard for the betterment of their career and enhancement of personality. The progress in education and career is also very slow and he/she has to immensely struggle to achieve a simple goal and leave alone tough things. There are times when there is lot of emotional upheaval leading to insanity and the native endures emotional pains and wish to leave the worldly pleasures. Individuals who opt for lottery, earning money from interest and share market endure excessive losses, the one that is irreparable. Thus, the financial status is overall very weak and always suffering from physical problems. The person is in total mental and physical unrest, it affects his entire life. He/she also sufferer from ancestral wealth deprivation and have issues and fixes with the family. He falls prey to conspiracy, court cases and social defamation. Their life is like a roller coaster, lots of ups and downs. Only rarely, he/she gets to experience some rise. These people are not harmful at all but very troubled from inside. In extreme cases, a very strong effect of Ananth Kaal Sarpa dosh is combined with other malefic planets. This can cause lot of harm to the individual making him a total addict and an intoxicated person. He may even pass away at a very young age. For instance, if Rahu is positioned in the first house of Cancer horoscope, ketu sits in the seventh house of the horoscope Capricorn, Sun resides in the fourth house of Libra with Mercury. Saturn is placed in the third house of the same horoscope in Virgo sign then there are chances that the person would become a drug addict. 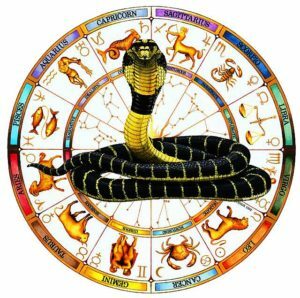 Kulik Kaal Sarp Dosh – Rahu is placed in the second house and Ketu is positioned in the eighth house and all the other planets lie in the natal horoscope. This is a deadly combination for an individual’s health. There are possibilities of accidents and losses, true that health would always be an issue. There is even lack of financial prosperity for an individual affected by this dosh so suffers from insecurity. You must note that there are chances of defamation as well. An individual affected by this dosh does average in academics and leads a partially happy married life. He faces lot of hurdles and mainly faces cheating and has lot of problems in getting kids after marriage. With so much struggles and grief, his nature and moral value sinks and looks much older than his age. He has no courage or chivalry at all, just so stooped down in grief. He only succeeds to some extent due to his hardworking nature. 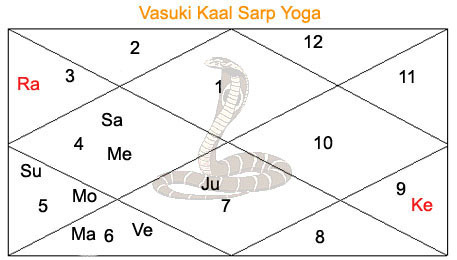 Vasuki Kaal Sarp Dosh – Rahu here is placed in the third house and Ketu is placed in the ninth house. All the other planets lay in the middle of these two and it’s called ‘Vasuki’ Kaal Sarp Yog. The individual is not usually good terms with other family members. He needs to struggle exceptionally to get established in life and get recognition. There could be fits of fortune and misfortune, lots of ups and downs. His relatives and friends always try to cheat and trap. He lacks mental peace and suffers from different ailments. He has heavy expenses and his financial position is also extremely unstable. He has to make immense efforts but success is not guaranteed. When moon is troubled, his mental health is shaken and disturbed. This sort of planetary condition compels him to suffer losses and legal matters. His career is disturbed as well. 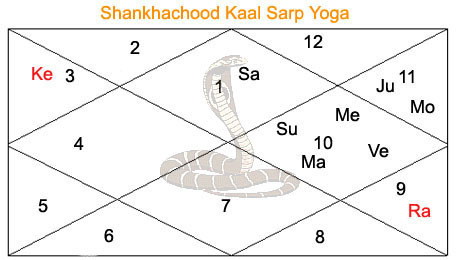 Shankpal Kaal Sarp Dosh – Rahu takes the 4th house and ketu stays in 10th and the Shankpal dosh takes place. The native is deprived of domestic harmony, comfort and happiness in general. He stays troubled in all walks of life, mainly personal. People in this house should have a very strong ‘Sun’ influence to sustain. There is lot of stress and anxiety in one’s life. Do not surprised if he/she has an illegitimate child, this dosh is responsible for it. 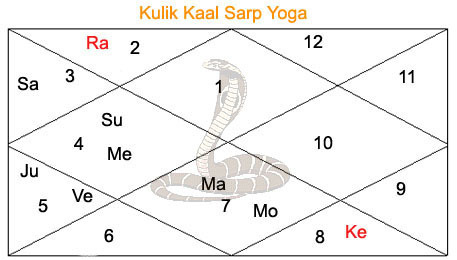 Padam Kaal Sarp Dosh – Rahu occupies the 5th house and ketu chooses 11th. The individual needs to undergo immense struggle when it comes to education and children. He is emotionally drained and very insecure because most do not love him. After marriage, it won’t be easy to get child/children. There are chances of falling prey to extra marital relationships, be very careful. There are lots of chances of being betrayed by people around you. If the moon is restless, he might be disturbed by spirits. He might fall ill and takes lot of time to recover. 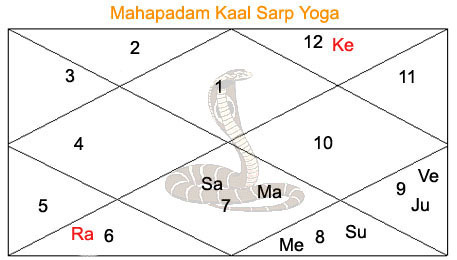 Mahapadam Kaal Sarp Dosh – Rahu seats in the 6th house and Ketu takes 12th The individual is surrounded by enemies, mainly secret ones and is affected by a number of diseases. He faces problems related to occupation. He might develop an inclination to foul play with land, law and get into serious issues and troubles. 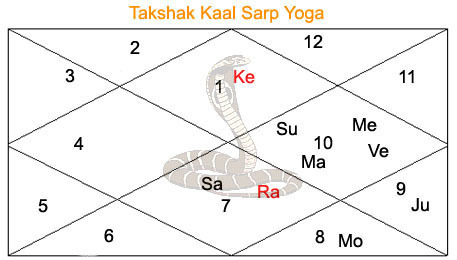 Takshak Kaal Sarp Dosh – Rahu resides in the 7th house and ketu comes in the 1st and this dosh is formed. The person affected gets extremely speculative and has tendency of losing wealth and fame due to liquor, women and gambling. There is no marital bliss in his life and faces difficulty is every step or phase of life. He is not good to start a partnership trade and must not go into a love relationship. 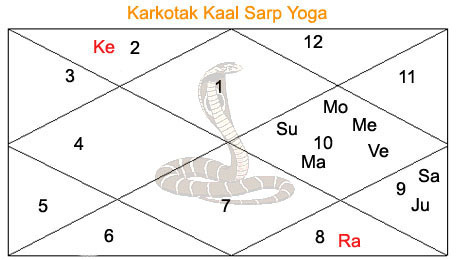 Karkotak Kaal Sarp Dosh – Rahu seats in the 8th house and ketu conquers the 2nd. The native has lot of enemies and loses his temper frequently. He is more prone to living life like and with anti-socials. He is mostly deprived from paternal wealth and drowns in ill habits like excessive smoking, drinking and abuse. He entirely falls in a bad company due to this dosh. He will suffer from health issues and there are chances of accidents. Shankhachood Kaal Sarpa Dosh – Rahu takes the 9th house and ketu the 3rd and this dosh is initiated. These sufferers have immense ups and downs in life. They cultivate the habit of telling lies and get angry soon. Progress is hindered by ill luck and he does not have healthy relationships. 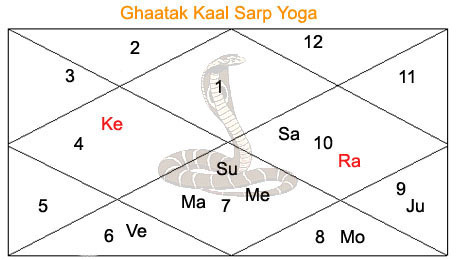 Ghaatak Kaal Sarp Dosh – Rahu is seated in 10th house and ketu in the 4th. Law related cases are very common in his life and the results can be strict punishment. Professional life is not very stable and can get into office related troubles. Their life is usually unhappy and career is not good at all. 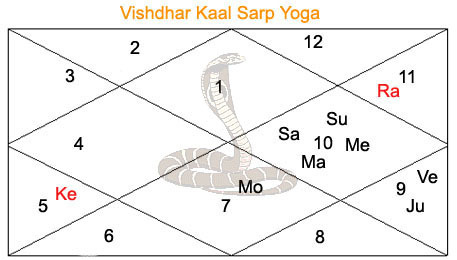 Vishdhar Kaal Sarp Dosh – Rahu is in the 11th house and Ketu resides in 5th. Here the main problem initiated from kids and the first half of their life is not a peace at all. Education of the individual and giving birth in cases of women are hampered. There are chances that his good name might get spoilt in the society. 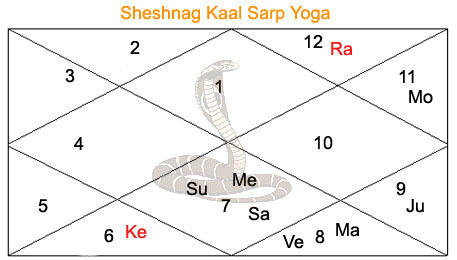 Sheshnag Kaal Sarp Dosh – rahu occupies the 12th house and Ketu stays in 6th. These natives are very selfish and are most likely to fall in trouble related to litigation. Health will always be in turmoil and would be settled in a very far away place in life. Kaal Sarpa Dosh is mainly two types based on direction – Ascending and descending. If Rahu eats all of the seven planets, it’s known as Ascending kaal sarpa dosh. If all planets lie at the back side of rahu, it’s known as Descending. If all the houses located in between Ketu and Rahu have planets positioned, then the dosh is very effective. If the Sun or the moon is there along with ketu or Rahu, the dosh is dangerous. Now, if Sun, the moon and rahu are situated together, it’s known as ‘grahan kaal sarp dosh’. This one is the most powerful among all types of dosh. An individual who is affected by this grahan kaal sarp yog should see an astrologer soon, very soon for effective remedies. A dosh is not very effective if one planet is seated outside the rahu’s and ketu’s axis and it’s known as ‘partial kal sarpa dosh’. Whatever the dosh maybe, get in touch a famous astrologer in Delhi . Bad effects on health and mind – Kaal Sarp Dosh have ill effects on a persons mind and physical health. They are mainly never physically fit and strong, most of the time sick with prolonged illness and feeble. They lack entire mental peace, confidence, gets stressed unnecessarily and an individual can lose mental stability while dealing with personal relationships. Ill effects on education and profession – They are not strong in education and fail in examinations. They seem less interested in higher education and there is least motivation for learning. There is basically no consistency in this field, career is destructive, no promotion and all so unlucky. Harmful effects on love life and marriage – There is betrayal and failure in love because the dosh never lets you succeed. Even after marriage, the relationship is not very good and mainly there is lot of delay in marriage. Married life is stressed, devoid of excitement, no romance and no good sexual life. There is extreme disharmony and difficulty in having children. Sometimes there is a divorce at the end. Unlucky effects on wealth and prosperity – There is no financial stability and prosperity. There can be extreme poverty and you might be pushed into debt. Life becomes very stressful when there is lack of wealth. Give prayers to the Nagraja on Sundays and try fasting on Panchamis, mainly Nag Panchami. On the day of Nag Panchami, pray to Nag dev and Lord Krishna. Chant Om Namah Shivay or you can do the Maha Mrityunjay Jaap. It’s a very special puja to calm the rahu planet and to reduce the ill effects of kal sarpa dosh. This puja is mainly performed in the Trimbakeshwar and the kalahasti temple. There are expericned pundits who know the entire norms of performing this puja. If you find out that the Lord of first, fifth and the ninth house are not overpowering the evil houses while you are affected with this dosh, you need to perform a specific puja. You can also along with this choose to do a pilgrimage to Rameshwaram and bathe in the holy waters. Purchase silver or any other metal statue of Sarp Raj having five heads and keep it in the altar at home. You can place in on uncooked rice and apply turmeric paste on the deity. Aastrologers suggest wearing stones including Garnet (Gomed) or Cat’s Eye (Panna/Vaidurya) seated in a silver ring and it’s to be worn in the middle finger. Again, we would say that don’t try to perform all of these without consulting an astrologer and there are other quick remedies as well. There are so many astrologers are earning huge sum by making a business out of this Kaal Sarp Dosh. Kaal sarp is of different types so wait till you consult and don’t assume anything about its effects. Fake astrologers are linking all problems in human life to this Kaal Sarp Dosh. They suggest extremely costly remedies like wearing gold, donating snake made from gold or silver and many other ridiculous stuffs. They do not go by ethics or morals instead only focus on money making by falsehood. Even there are so many so called pundits claiming this Kaal Sarp Dosh to a complete hoax where we can see so many customers coming to us with problems related to this. They are even leading a good life after we customize a short and quick remedial process for them. There are measures like puja, mantra, yog and so many other things and if you don’t visit a reputed astrologer, you wont even feel the good effects but money would be gone. Don’t assume or imagine or think, to be sure of what you must do to get rid, get in touch with the best astrologer in Delhi. People affected by this dosh have to face lot of hardships from young to old age if not treated at the right time. As you can see that the effects of kaal sarpa dosh depends a lot on the planetary positions. All people who are suffering from this are not equally affected. So it’s most important to have a word with a reputed astrologer, one who is a good consultant. You can research and find the best astrologer in India and opt for a consultation. We basically do not suggest thousands of and complex remedial measures. You might have come across high prices remedial measures but when you come to us, there is no need to worry. We do not charge such soaring costs from any of our clients. We try to suggest the simplest and the most affordable remedy based on what your personal horoscope says. Understanding the kundaali is more important and we do that first. Our clients are very happy with the results and they are all now our returning clients. The good we do to people, our results speak more about the brand. Keep in mind that detection and analysis plays a big role and we do it the best. You need the blessings of Lord Shiva and Naag devata. Please visit our website where you can hear from our clients, their story and our success in the testimonials section. We want you to believe in our abilities and credibility before you come to us. We believe in harmony, faith and wellbeing because every human being deserves to live a good life. Copyright © 2003 by kaalsarpdosh.co.in. All Right Reserved.